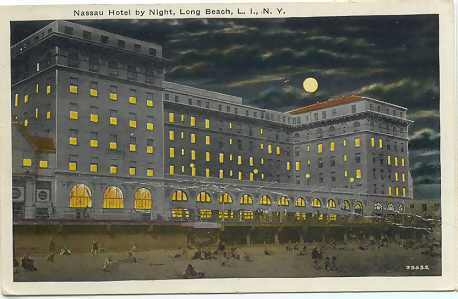 An Older LB postcard. Notice the old City Hall building in the "L" !! 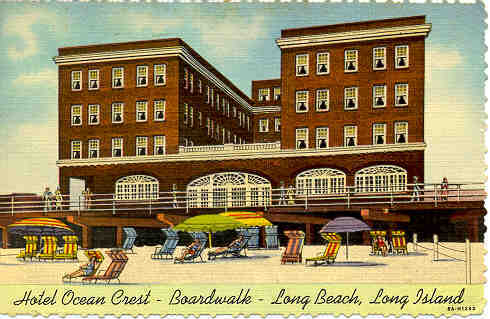 The Hotel Ocean Crest, SE corner of Laurelton and Broadway, it later became the Waldorf, then Scarf's Waldorf Manor, then Scharf's Manor and finally the Hoffman Manor, which it is today! 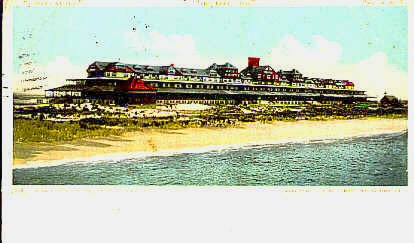 A rare color rendering of the Long Beach Hotel, about 1900, from a postcard image. 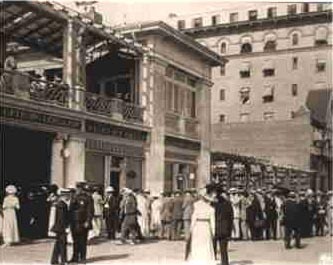 An old photo of the bath house at the Hotel Nassau, probably about 1915 or so. This was a great find. 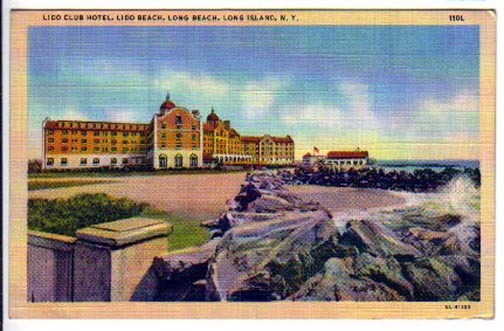 This postcard titled "View Looking West from the Long Beach Office" clearly shows the old Village Hall in the right foreground, (later moved to National and Park) just beyond it is the Castles By the Sea Theatre, and in the distance is the Hotel Nassau. The Tower Baths, destroyed by fire in 1965, would be on the other side (West) of the Castles by the Sea Theatre, but they were not built when this was taken. The Castle Theatre burned down in the 30's. Roll your mouse over it to see the view from the West looking East. Another great shot looking East from the Hotel Nassau. 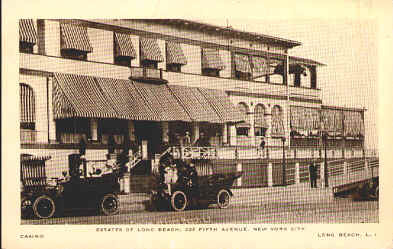 The Long Beach Village Hall is the first building visible on the left. 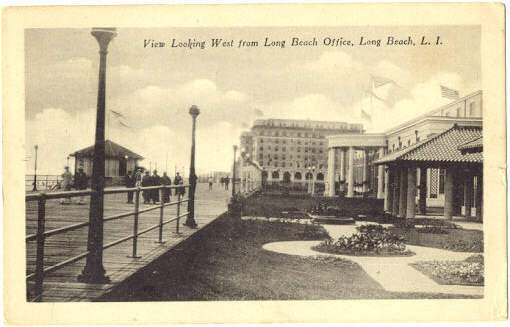 The buildings in the distance are the Casino (shown below) and the group of buildings that included the Dauville, Trouville and other bath houses at Long Beach Blvd. 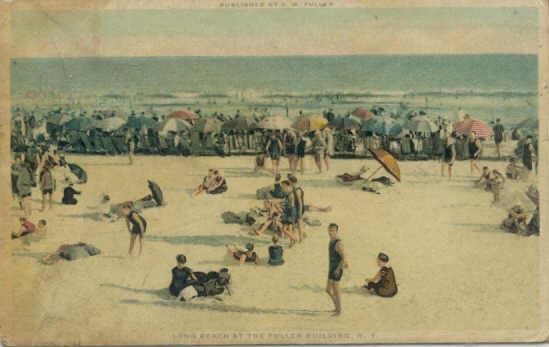 Another old postcard showing several different scenes. The picture on the left is captioned " Casino " in the lower left. 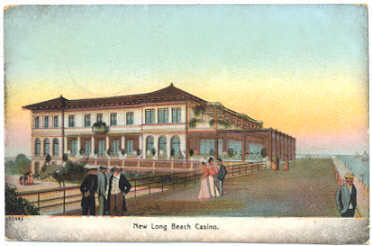 The one on the right is captioned " New Long Beach Casino". They are definitely the same building, look at the arched window designs. The picture on the right is a little different as the artist may make changes when he draws it. 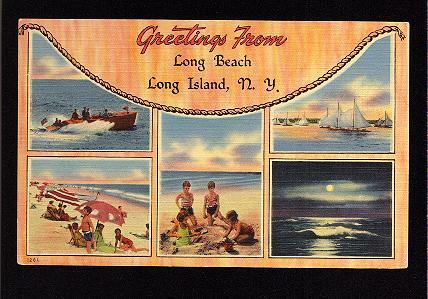 I think the postcard on the right may be older by it's design. Also notice the one on the left has had awnings added. 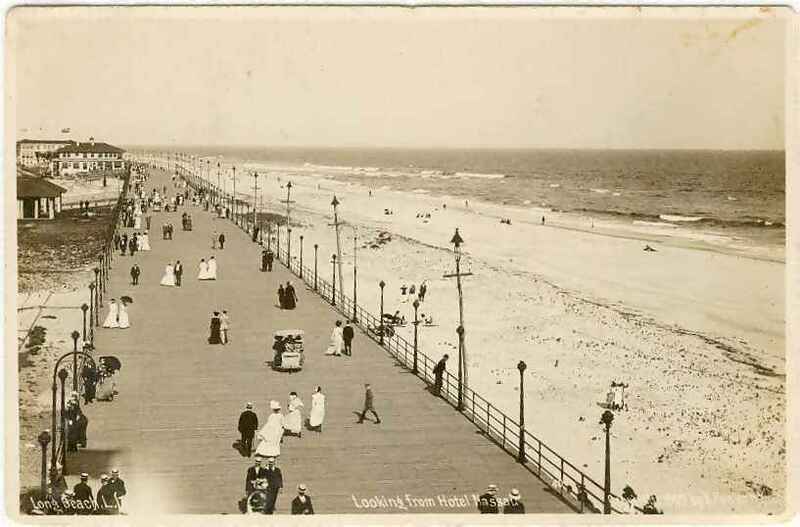 After finding some other photos (shown on the Early 1900's page) I determined this was located at Long Beach Blvd and the boardwalk. It was later known as "Thomas Healy's. 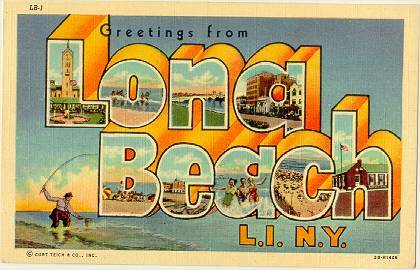 I know you have pictures of Long Beach somewhere! Don't lie! I know you have them! So how about scanning them and emailing them to me! If you can't scan them, you can mail them to me and I'll scan them, return them and send you a disk with them on it. Email me for my address. Come on now folks, I need some new material! Bathing in front of the Fuller Building, near Riverside Blvd.